Though seemingly the staid stuff of gentlemen’s clubs and smoky, after dinner cigar rooms, Portugal’s most famous wine, Port, is always quietly innovating. Two recent products illustrate this, both from illustrious Port houses, and aimed at winning new Port drinkers with new-style wines. 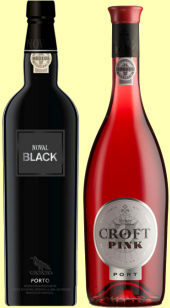 ‘Pink’ and ‘Black’ are as contrasting as their names suggest, but both add welcome breadth to this category. Noval Black is a striking new reserve Ruby Port from Quinta do Noval that comes in a minimalist black and silver bottle, and the wine indeed pours not quite black, but a very deep, opaque ruby. On the nose cherry and ripe red fruits dominate, with a touch of chocolate and fudge and a deep, briary note. On the palate this is silky smooth, the intense, creamy cherry and red berries filling the mouth, though it is medium bodied and medium sweet, with quite a grippy framework of tannins and acidity. The spirit is not too obtrusive, and there’s a freshness about this in the finish that is very pleasing. Robust and yet with some elegance, this is an approachable and satisfying Port to drink with chocolate desserts or, chilled lightly, as a pre- or post-dinner drink. 88/100. £14.99. The phenomenal rise in the popularity of rosé wines over the last decade has led to a flood of new pink wines from all over the world, but perhaps one of the most unusual is this wine, launched by Port house Croft in 2008. Made from classic Port grapes given just a short skin contact, then made as a white Port with a long, very cool ferment to preserve some delicacy, the nose is extremely attractive with bright, creamy raspberry, cherry and Sarsaparilla notes and no sense of the alcohol. On the palate, served well chilled as recommended, the intense red fruit floods pleasingly across the tongue with quite a luscious, stickily moreish sweetness, before a bit of heat and bite from the spirit kicks in to add a bit of heat and grip on the finish. The wine is suggested as a mixer with soda water or plenty of ice, and as a cocktail ingredient, and I must say winemaker David Guimeraens has done a really good job with this. 87/100. £9.99 – £10.49, Tesco, Sainsbury’s Co-op, Morrisons. See www.croftpink.com.